Can you make a telephone using only cups and string? Engineering challenges like this one help children develop problem solving, observation and teamwork skills and much more. In this challenge, your students will learn about properties of different materials and the transmission of sound as they work to design working “telephones” using simple materials. If you have younger children, you might choose to poke holes in the cups ahead of time. If you are using metal cans, you should do this despite the age of your students and make sure that there are no jagged edges. Ask your students if they’ve ever heard sounds through a wall or from a floor above or below them. How did the sound travel to them? You can have kids pair up, with one child placing his/her fingers in both ears and his/her partner gently tapping the first child’s elbow. Can they hear anything? If you are lucky enough to have a tuning fork handy, this works even better—you can strike it against a table and touch it to each child’s elbow. Challenge your children to create their own homemade telephone system using simple materials. Have children work in pairs. Show your students the materials they have to choose from. Ask them which part of the telephone they think the cups will be. What about the string? Children will use two cups, 30 feet of string and a few paper clips to make their telephones. Ask them to pick one type of cup and one type of string to try at first. If they want to try something new, have them just change one of the materials at a time, either the type of cup or the type of string. After 15–20 minutes of activity, if every team has made and tested at least one phone, stop your students and bring them together to share their observations with each other. This discussion should last no more than a few minutes. Did anyone have a successful trial of a phone? What materials did they use? Have them demonstrate the use of their phones. Send them back to experiment more. When each team has a working phone, you can pass out note cards with phrases you would like one child to relay to his/her partner. When the listener clearly hears what the talker said, they can switch, with the new talker reading a new phrase. The string needs to be tight between the cups—a loose string will not transmit sound as well. If something is touching the string (ex. a finger, a wall, etc. ), the phone won’t work as well. If the speaker or listener is holding the cup perpendicular to the string, so that the string is touching the edge of the cup, it will dampen the sound. The paper clips are used to help keep the string from pulling through the hole in the cups. Children should tie the ends of the string around the clips inside each cup. Let them try to discover this themselves before you suggest it. 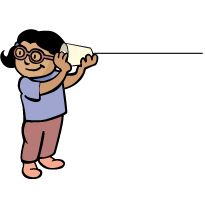 Now that your students have discovered how to make working string phones, challenge them even further with the String Telephones – Conference Calls activity.